Enjoy a banana split and raise money for the OCRF, Ovarian Cancer Research Fund! Foodbuzz is posting a challenge and a Top 9 takeover on Monday, July 19th for this cause and will donate $50 for every Banana Split posted by a Featured Publisher. You can read more about this cause at Kelly Confidential. With the abundance of berries at the stores right now, I decided to make my own strawberry sauce to go with the banana split. It is a very simple recipe that does not have too much sugar in it. This sauce will also be good with scones which will come in a following post. Place strawberries and sugar in a saucepan. Bring to a boil and reduce heat to simmer for about 12 to 15 minutes. Remove and let cool. The sauce should be thick and syrupy. For the chocolate sauce, I melted ¼ cup Nestle’s Toll House semi-sweet chocolate swirls in the microwave at 50% power setting for 60 seconds. Stir in 2 tablespoons of milk and microwave at 50% power setting for another 30 seconds. To assemble, peel banana and slice in half lengthwise. Lay the two halves in a boat or bowl. Slice banana to fit. Put two to three scoops of ice cream between the banana halves. Place berries and chocolate chips decoratively in the bowl. Drizzle with chocolate and strawberry sauce. 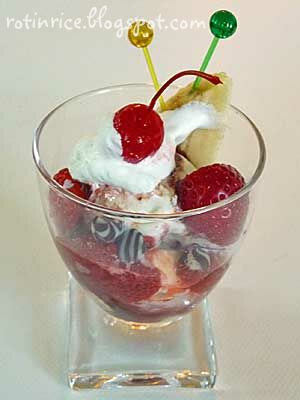 Top each scoop of ice cream with whipped cream and cherries. These are our other creations. Have fun! Beautiful! Thanks for the heads up about the Banana Split Event. I hadn't seen anything about it yet. Most certainly will try to participate. All the banana split variations looks delicious. you have won the banana split award! looks very delicious and sweet. love the abundance of strawberry! I want them all Biren! Good luck with the challenge. They look super good! The strawberry sauce sounds fantastic. Very nicely put together, Biren. Really like those banana split boats. Yay for tht challenge! Great idea. I love your banana splits, i wouldn't mind any of em! that is so pretty Biren….looks yummy! This banana split looks so yummy. 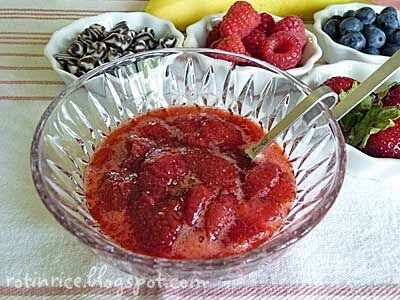 Especially the strawberry sauce….I will try to make it at home this weekend. Thank you for sharing this recipe. I love the first sundae – and you made your own strawberry sauce? Very rajin, you LOL Best of luck for the challenge. Hope you win!!! Nothing I can see all these pictures, except wow wow wow!!! 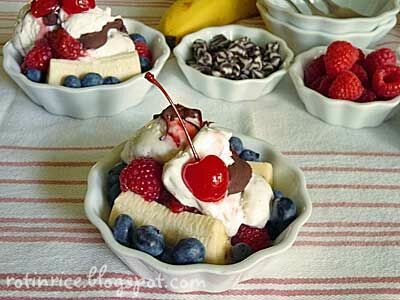 Beautiful and yummy looking banana splits Biren. I'm afraid to show my daughter as I know she would want one. Great, great job with these Banana splits. 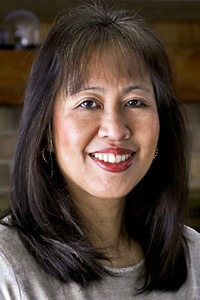 I am a big fan of your creations. Good luck with the contests! NEED ONE! I haven't had a banana split in AGES! Been seeing a lot of banana spilts! 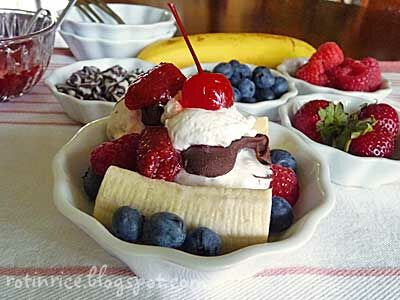 mmm banana split, a great summer dessert! I want some too! Haven't had banana splits in a long time! Thanks Leanne! It was fun putting these together. My teenagers enjoyed it and wouldn't mind having it more often. I would have love to pass one on to you 🙂 Perhaps that may be possible in the future!!! hanks! The sauce is really easy peasy. Hope you enjoy making it. I do too but it was my eldest who got to eat that one. The strawberry sauce is easy peasy. I do every year when the strawberries go on sale. Thanks! It's really easy to put together. You can get the strawberry and chocolate sauce in bottles. A healthier version is to just assemble them with the berries and fresh cream. I have not had one for a long time too before this. My teenagers loved it! Great for this time of the year! Yes, it is getting pretty warm over here in MN. It's great to have ice cream. 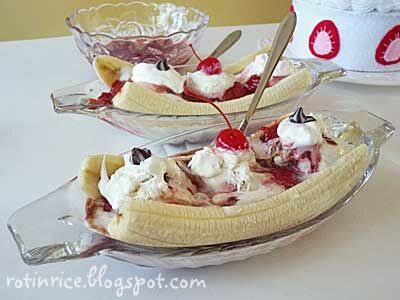 Your banana split looks scrumptious with your homemade strawberry sauce! And it's such a great cause – I hope I have time to get my entry in. Yum! Your banana splits look divine! I'm sure my kids would love if I participated in this event. Enjoy your dessert! Good luck with the contest! Your splits look good really yummy!